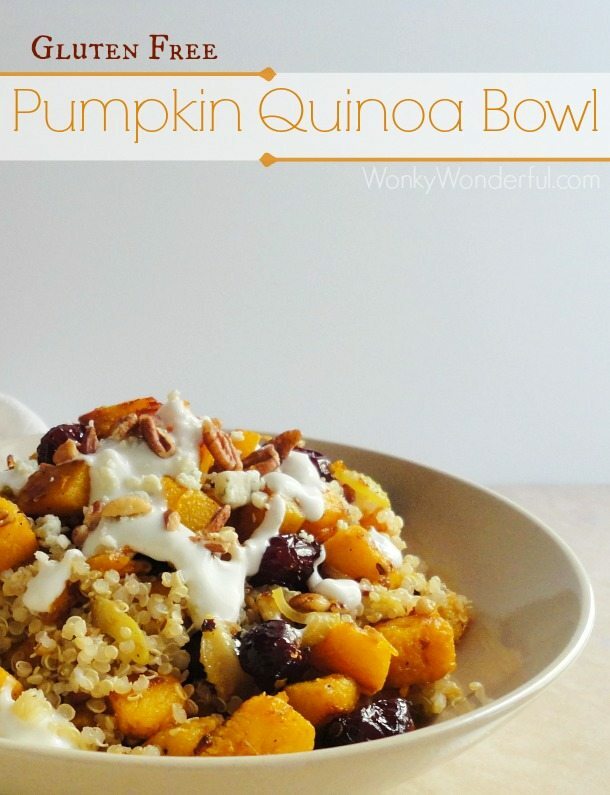 This Pumpkin Quinoa Bowl is gluten free, vegetarian and full of fall flavor! The quinoa, pumpkin, cranberries, pecans and gorgonzola come together in a perfect blend of textures and flavors. I created this dish for the Very Vegetarian Recipe Challenge hosted by OXO and Plated. 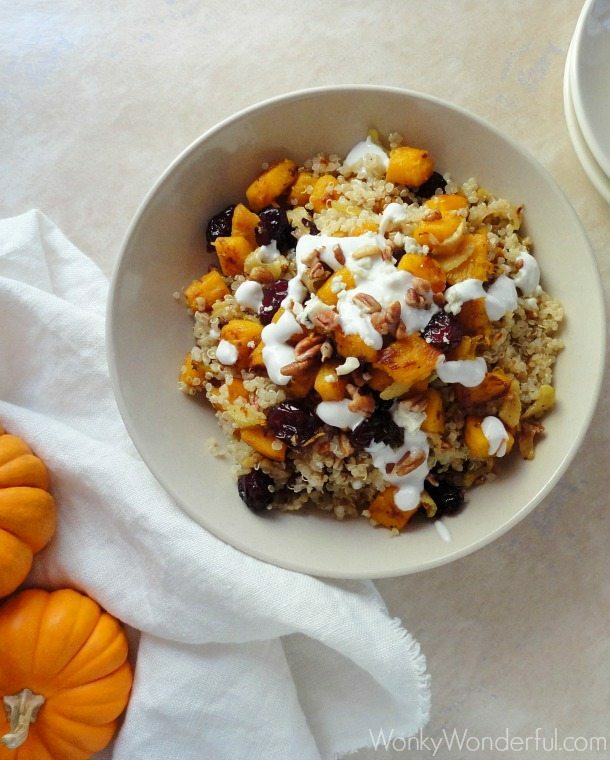 It is down to a chilly 78° here in California, which means time for some fall recipes! Once the temperature drops about five more degrees I can finally get started on my fall baking . . . WooHoo! I’ve used pumpkin puree in many recipes but I realized that I had never used fresh pumpkin in any of my meals. Probably because I dislike the entire process of cleaning pumpkins. I’m not a big fan of carving pumpkins just for that reason. I hate scooping and scraping out all of the pumpkin seeds and goop! I decided that the Very Vegetarian Challenge was the perfect opportunity to try my hand at a pumpkin recipe. For participating in this challenge OXO supplied me with a variety of handy kitchen gadgets, including a 2 piece Fruit Scoop Set. All of the gadgets are great, but those Fruit Scoops are Amazing! I cleaned out my pumpkin in less than twenty seconds . . . Crazy! I may even carve a jack-o-lantern this Halloween, using my handy-dandy new fruit scoops. Learn more about Plated – Gourmet ingredients and recipes delivered to your door! Include vegetables, starch/grain and a protein. Only require 5-6 easy steps to follow. No blenders, food processors or dutch ovens allowed. Recipes are ready within 30 minutes, start to finish (including chopping). I have to admit, the 30 minute time limit was a hard one for me. I’m more of a leisurely cook. You will never catch me on one of those frantic cooking competition shows, that is for sure! 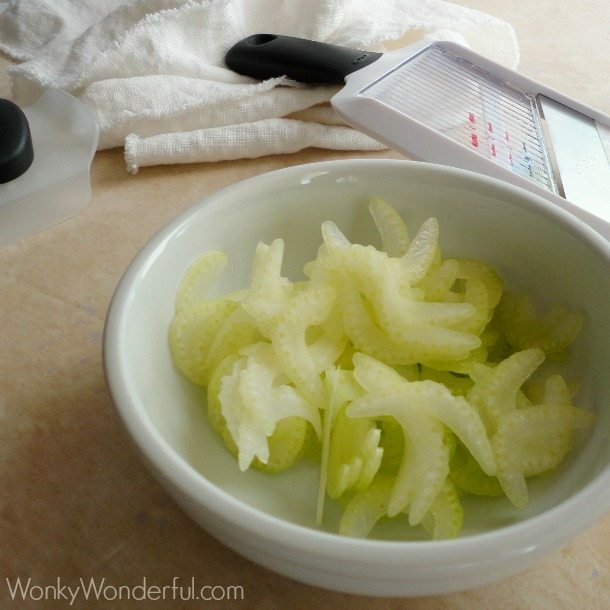 Use the OXO Handheld Mandoline on setting 1 to slice the celery extra thin. Clean the pumpkin with the large OXO Fruit Scoop. I suggest using both hands to do this, but I needed my other hand to take the photo. 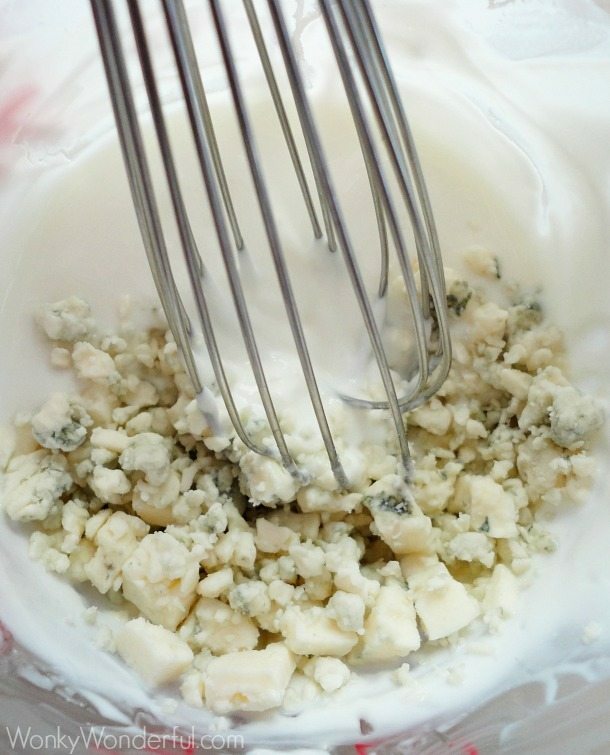 Use the OXO 9″ Whisk to mix the creamy gorgonzola dressing. 1. Begin cooking quinoa in water according to package directions. Some quinoa requires a rinse before cooking. 2. Prep the celery and pumpkin. Thinly slice the celery. 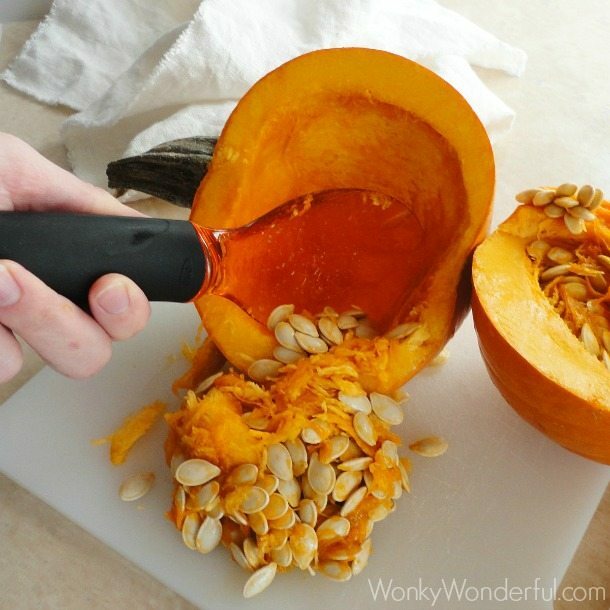 Cut pumpkin in half then scoop out the seeds and goop. Carefully remove the pumpkin skin, cutting from the top in a downward motion. Chop pumpkin into one inch pieces. 4. Melt the butter and oil in a large sauté pan over medium heat. 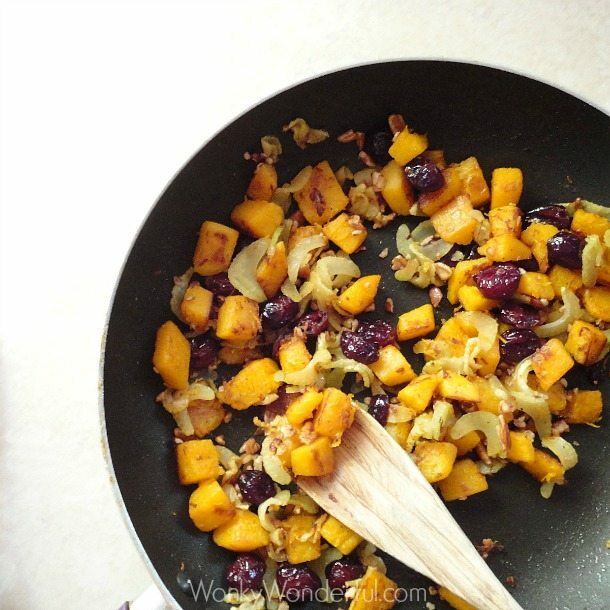 Add pumpkin and cook for 10 minutes (until soft and slightly browned), stirring frequently. Add the celery and cranberries, cook for 5 more minutes. Add salt, pepper and pecans 1 minute before removing from heat. 5. 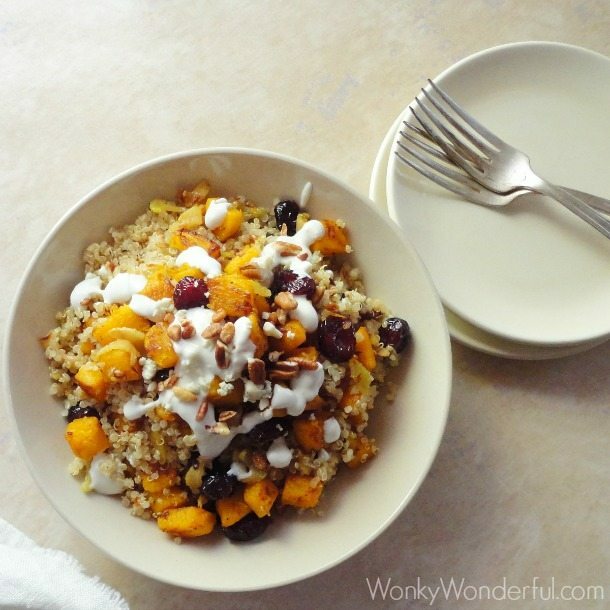 Mix the sauteed pumpkin mixture with the cooked quinoa. Top with a dollop of gorgonzola dressing. Add some extra chopped pecans and gorgonzola crumbles to finish (optional). Serve immediately. *Make sure you buy the cooking/baking pumpkins! Now that looks nice! I like the fruit scoop too, how handy. Do you know we don’t have canned pumpkin here. So any pumpkin dish is from a pumpkin. So going to try this this week! We shared with our FB readers at homesteadlady.com. Thanks Tessa! I hope you enjoy. I wasn’t sure if all of these flavors were going to work … but I loved it! Beautiful dish, your photos are fantastic. Splendid seasonal flavors and colours. I’m not vegetarian but I would like to try this recipe.